We have allocated 2 hours specially for networking style events. This image will give you an idea. You will get this card at the registration desk. Don’t miss marking it and dropping it in one of the boxes. Over the next couple of days, I will blog about some of these events. I did not understand it, at first. I asked him to elaborate. He asked “what do your customers do after they get these alerts?”. Frankly, I had not thought of that. I knew what I would do, but I had no idea what our customers did. Fortunately, it was easy to fix that problem. We just asked a bunch of them. The moral of the story is that you need to think about what people do after they consume your product. You may be missing some opportunities for follow on products or providing a better solution. Let me paint a few sample scenarios, for you. You set up Google alerts. What do you do after you receive alert email? You search for a company or topic and get a bunch of results from Google. What do you do, after that? You locate an address using Google maps on your computer. What do you do next? A friend texts you an address for a meeting. Now you have a smart phone with a good online map support. What do you do next? The answer most of the time is – “it depends”. I think there are some opportunities for some nifty tools to help the ‘after that, what’ problem. As we switch more and more to mobile devices to help us cope with our life, more such tools will be useful. “After that what?’ is a good question to ask yourself, if you are looking for mobile product ideas. If you don’t want to do that, you can always ask me. I have a bunch of those problems. Posted on November 27, 2012 Categories Ideas, Creativity, Innovation3 Comments on After That, What? This keynote video by Tim O’Reilly is worth watching. I am a big fan of Tim and strongly believe that we need to “work on stuff that matters”. My notes from this video. You will get a feel for what he was talking about. Capital does not create jobs. Customers do. Tim talks about Gift Economy, Creative Economy, Sharing Economy, Gift Culture, Open source and the effect of these movements on people, businesses and economies. I never really thought of MeetUps as a trend indicator. It suddenly dawned on me that it can be the leading indicator of activities in different areas. Here is an example. I got a notification email from meetup.com on a meet up called RIAK. I checked it out and signed up. I got an email confirmation back. 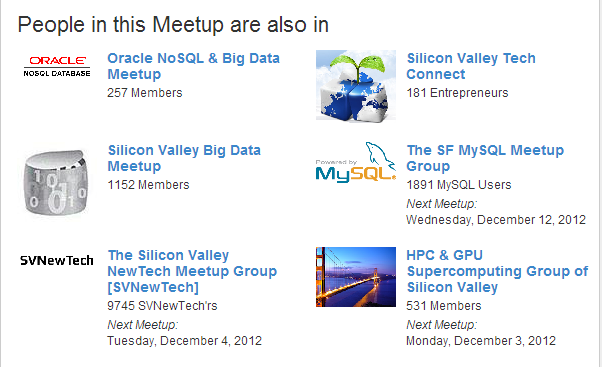 Look at the Big Data and MySQL meetups. But what intrigued me even more was SVNewTech with close to 10000 members. I mulled over this for a while. 531 members of HPC and GPU is an early signal. What kind of things do these meetups discuss? What do they do? I thought it is worth exploring a bit more. Have you explored meetups or other similar events? Do you think they are a kind of leading indicator of activity in a specific area? I am thinking of getting some input from you for some of my future blog posts. I have seeded a few topics. Can you vote for them or if you have other topics in mind, add them to the list, please? It was an article in Financial Express, a business journal. The topic was about “Buzz Entrepreneurs are creating in Chennai”. I was quoted in the article along with Suresh Sambandam and Chandu Nair. 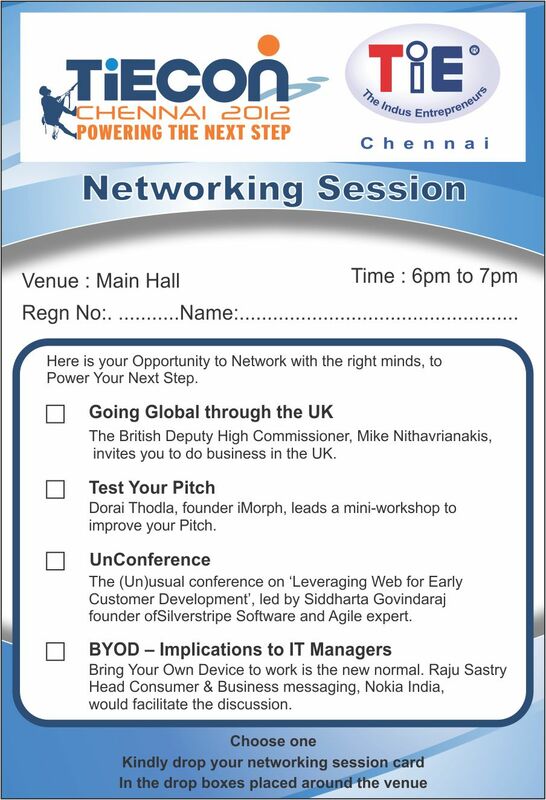 One thing common between all of us is that we participate in several entrepreneurial and tech communities like Chennai Open Coffee Club, Nasscom Emerge, TiE Chennai, The Startup Centre and Chennai Geeks. Some of us mentor startups. Some of us advice companies. Most of us spend a lot of time with fellow entrepreneurs. We have a sense that Chennai is rising. We don’t want to hype it too much, but we like what we see in the entrepreneurial scene. I personally feel that we are somewhere in the beginning of a big wave of young entrepreneurs. Our Chennai OCC meets are more fun. We all are striving to be Lean Startups. We learn from the Silicon Valley gurus like Steve Blank and Eric Ries, put our own spin, and experiment. A recent mentor day at TiE Chennai had over 100+ people attending (and 19 mentors). There is a sense of euphoria, cautious optimism and a feeling that we have the potential of being big players in a Global market. We have, of course, a long way to go. Companies like Zoho, OrangeScape, Fresh Desk are inspiring many Chennai product companies. It started with a post from Venkatesh Krishnamurthy, a familiar figure in the startup community. He posted the Financial Express Article and tagged me. I read the article and tweeted it. 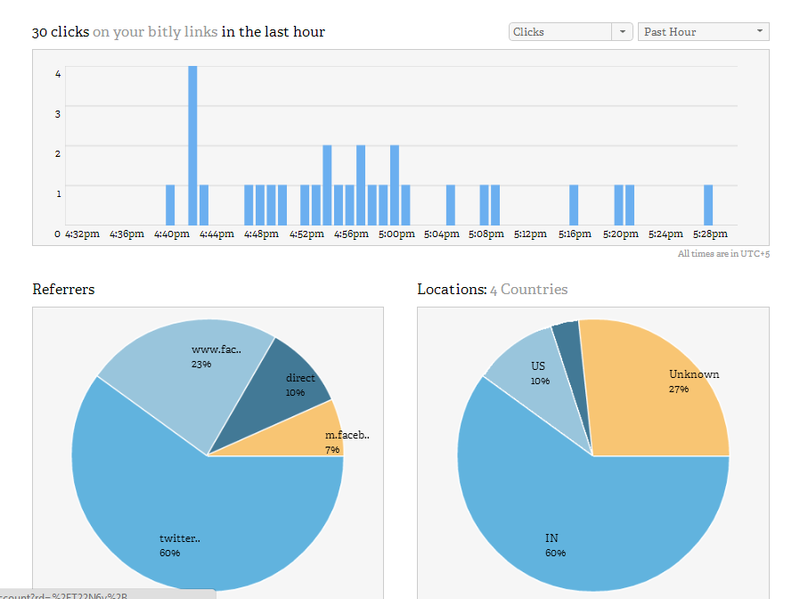 Like I do most of the time, I also shortened the URL using bit.ly. Within minutes, I got bit.ly alert. The link received about 23 clicks. I was not really surprised. The Chennai community is a very supportive one. You can see the stats here. What really surprised me was that there were clicks from countries other than India. That is social media for you. It is powerful and the best part of it is, the results (however small) are visible immediately. Within an hour of reading a Facebook post, I am hitting Publish on this blog post. 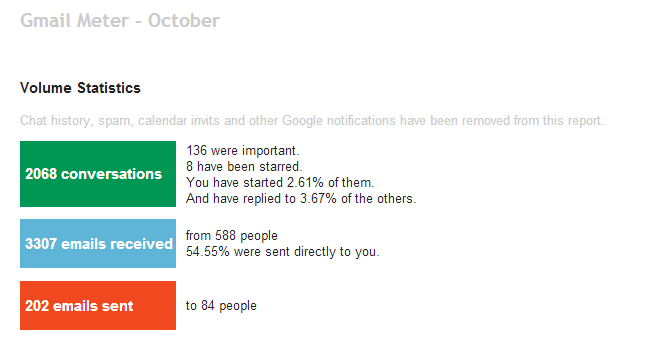 I knew I was spending a lot of time on gmail, but did not realize how much, till I saw this. And this is not even my official mail account! You may want to check it out. It is Gmail App script. If you are a startup, what cost metrics do you measure? For beginners, Steve Blank provides a great guideline in this talk on Metrics that Matter for Startups. 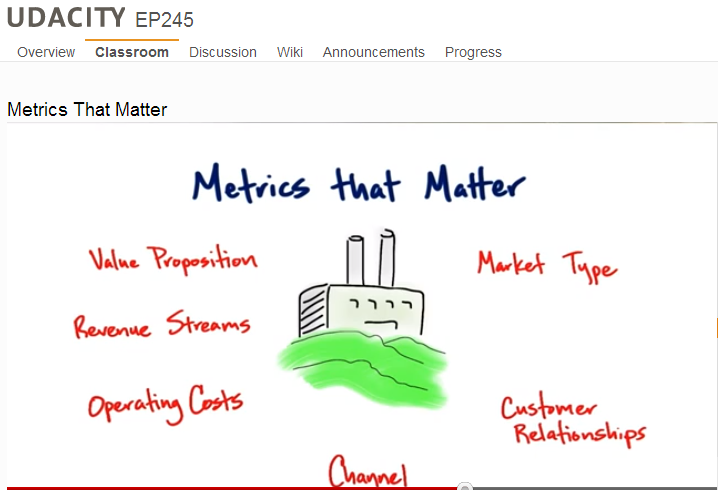 Check it out in this video on Metrics that Matter, a part of Resources and Costs module. If you are a first time startup, you will find a lot of value in this course. I have been thoroughly enjoying Steve Blank’s How to Build a Startup – The Lean LaunchPad Course on Udacity. One of the segments I was watching today was a talk on New Markets (one of the Market Types). Here are a few points from the video. The rest of the market types – Existing Market, Resegmented Market, Clone Market have a little less risk. Here is a link to the resources. This course is a must, if you are a startup.